J.D. Jarrell is the real deal when it comes to country music. A mainstay of the Nashville music scene for years, J.D. was even a member of Loretta Lynn's studio stable for a stretch of time. His catalog is brimming with lessons on country songs, string bending, bluegrass rhythm, hybrid picking, using the b- bender, boom-chick strumming, and more! This tutorial was inspired by a great country classic from the legendary Merle Haggard in 1968. This song is one of the most requested, and it can still be heard several times a day on lower Broadway in Nashville. We'll learn the verse and chorus chord progressions, the signature intro lick, the solo and tone, the dobro parts, and there's an acoustic and electric play along to boot! This tutorial on fast bluegrass rhythm was inspired by a friend of mine in the forum. He asked about the strumming techniques all the legendary bluegrass guitar pickers used when playing really fast songs. Im using only downstrokes with the pick, to put even more drive into it. These lessons are the 1, 4, and 5 chord in the key of G, using this fast boom chick strumming pattern. This tutorial on fast bluegrass rhythm was inspired by a friend of mine in the forum. He wanted to learn fills used to walk into the next chord, and I'm still using only downstrokes with the pick. In the first lesson the fills walk you into the 4 chord, and then back to the 1. The next lesson walks into the 5 chord, and back to the 1. The third one is playing everything together, and the last two are G runs picking up and downstrokes. This tutorial on driving bluegrass rhythm was inspired by a good friend of mine in the forum. He wanted to know about strumming techniques all the legendary bluegrass guitar pickers used. This 16th note boom chick pattern is another one, and here I'm using a ghost strum too. I'm playing up and downstrokes with the pick, and using the 1, 4, and 5 chord in the key of G.
This tutorial on driving bluegrass rhythm was inspired by a good friend of mine in the forum. I'm using only downstrokes with the pick for the fills, but using up and downstrokes for strumming. In the first lesson I used the fills to walk into the 4 chord, then back to the 1. In the next lesson I walk into the 5 chord, then back to the 1, and the last one is the full progression. This tutorial on driving bluegrass rhythm was inspired by a good friend of mine in the forum. He wanted to know about strumming techniques all the legendary bluegrass guitar pickers used. This is another 16th note boom chick pattern, but it doesn't have the ghost strum in it. I'm using both up and downstrokes with a pick, and strumming them with the 1, 4, and 5 chord in the key of G.
This tutorial on driving bluegrass rhythm was inspired by a good friend of mine in the forum. I'm using only downstrokes with the pick for the fills, but using up and downstrokes for strumming. In the first lesson I use the fills to walk into the 4 chord, then back to the 1. The next lesson walks you into the 5 chord, then back to the 1, and the last one is the full progression. This tutorial on syncopated strumming patterns was inspired by a good friend of mine in the forum. He asked about some of the bluegrass strumming techniques that can drive the rhythm of a song. I'll start with a couple of easy ones, and then get into the more complicated patterns. I'm using a G chord for all of these, so you can hear the difference that the syncopated strumming makes in the sound. This tutorial on crosspicking was inspired by a subscriber in the forum, and in these lessons I'll get you started by showing you a simple pattern starting on different strings. The first one is using open strings, and starts on the 4th string. Then I'll show the roll starting on the 3rd string, the 5th string, and the 6th string. Then I'll put them all together, and crosspick from C to G.
This tutorial on crosspicking was inspired by a subscriber in the forum, and in these lessons I show you another pattern used for crosspicking. I'll show you the same pattern starting on different strings, and then put them into 3 exercises using the 1, 4, and 5 chords in the key of G. Then I'll show you the combinations for a 1, 4, 5, 1 progression, and there's even an alternate ending. Four Flatpicking Bluegrass Licks In G! This tutorial on flatpicking was inspired by my earliest musical influences, and also the greatest flatpickers in history. The first lesson has a couple of licks for the G chord, then the next one I start in G and go to the 4 chord. Then I go back to the G chord for the third lesson, and in the last one I go to the 5 chord, and then back to the G chord to finish it up. By the end of this tutorial you should be able to play examples that combine choking strumming technique using barre chords. 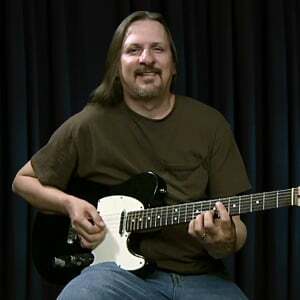 By the end of this tutorial you should be able to combine the boom-chick strumming technique with barre chords rooted on the E string.